Dr. KP Stoller MD, is a Fellow of the American College of Hyperbaric Medicine (FACHM) and co-founder of the Hypberbaric Oxygen Clinic of San Francicsco (HBOSF). 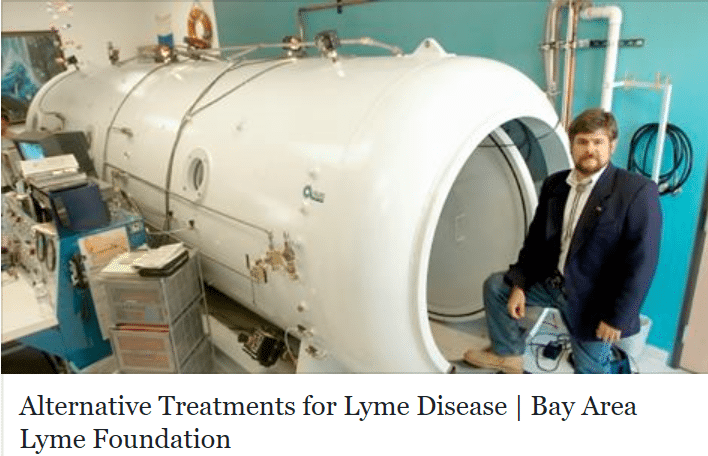 Having treated patients with Lyme disease for more than two decades, Dr. Stoller is an advocate for Hyperbaric Oxygen treatment (HBOT) and other alternative therapies for patients battling post-treatment Lyme disease (PTLD). He wrote to Bay Area Lyme to share his experience and expertise. “In 2013, Woods Hole Oceanographic Institute discovered that the Lyme-causing Borrelia burgdorferi organism is manganese-dependent, because it substitutes manganese where almost all other organisms use iron for survival. By using manganese, the Borrelia is assisted in evading the immune system, which typically responds to foreign pathogens by starving them of iron. Further, manganese is important for the human body (helping to monitor blood sugar levels, supporting production of collagen for tissue repair, and even helping the central nervous system to function properly) and there is no easy way to shut down the manganese supply to these organisms. “Now, before you go and stock up on loratadine, the desloratadine/manganese study was done in a lab (in vitro) and was not a clinical study (in vivo). Many things look promising in the lab but never pan out when used in a living patient. Many unanswered questions exist, not the least of which is dosing – is the normal 10 mg a day of loratadine enough to do the job in an adult human? Slowing down manganese transport is not the same thing as stopping it. After all, we are hoping to kill every last organism, not put them on a diet. “My anecdotal experience with PAS is that, at 2/3 the dose recommended for treating tuberculosis, it takes about two weeks to bring down manganese levels enough for the organism to start to suffer and for patients to feel a deeper level of relief. I have had no one report that 10 mg of loratadine was doing anything for them one way or another. That doesn’t mean it won’t or can’t but, again… what is the correct dose, and if the correct dose for doing this is well beyond the normal dose then there will there be untoward reactions to taking so much loratadine? The problem is no one knows yet. “I have used PAS for a couple of years now, but not just with Lyme. I have used it in patients who exhibit Parkinsonism, because for many there is manganese-toxicity in the parts of the brain that deal with dopamine. I have seen it work many times, so I know it is bringing down manganese levels. Using PAS at a fraction of the dose used to treat TB also makes me feel comfortable using it off-label. “Many Lyme patients feel that herbs are the best way to treat this disease. I am very supportive of using and understanding botanical medicines, but I don’t think they can work their magic consistently enough in the case of Lyme and should be considered supportive only. “Garlic  and Oregano  to name two, are well known for their anti-microbial ability and seem to do so by inhibiting quorum-sensing, which is an ability to turn genes on or off depending on the density of other bacteria in the local environment. Phenolics such as thymol and carvacrol in Oregano interact with surface proteins of bacteria, leading to an alteration of the cell surface and thereby compromising the initial attachment phase of biofilm formation. The rate-limiting step is whether any particular patient is willing to consistently take their herbal remedies in the quantity and frequency to allow them to eliminate the infection. Just using these two herbs, garlic and oregano, which I would consider medicinal foods, requires the consumption of considerably large quantities, taken every few hours, to accomplish the objective – and for how long? Taking mass quantities of garlic and oregano around the clock for months is not something I would expect a lot of patients to comply with. “Don’t get me wrong, it can be done. I had to self-treat myself with a persistent pseudomonas lung infection in the days before the antibiotic ciprofloxin came out and it required bottles of garlic extract multiple times a day, and eventually I got rid of an infection that I struggled with for months. Garlic is always my “go-to” herbal anti-microbial agent, with oregano oil a very close second. I know there are other herbs – teasel root, samento, etc. – no room in this post to mention them all. “I will mention hyperbaric oxygen therapy (100% oxygen under pressure). I have been treating Lyme patients for 15 years with HBOT, as it is often called, because not only is the Lyme organism vulnerable to high oxygen tensions (anything above 160 mm Hg partial pressure) but, under pressure, HBOT seems to penetrate deeply into bio-film. Dr. Kenneth Stoller, MD, completed his training at the University of California, Los Angeles School of Medicine. He was a practicing board-certified pediatrician for over two decades, focusing on brain-injured children and adults. Dr. Stoller’s other area of expertise is known as integrative medicine. Since the late 1990s, he has been working with patients with brain injuries including traumatic brain injury, stroke, autism, cerebral palsy, MS, chemo-brain, and Lyme disease. While working in a psychiatric clinic in the San Francisco Bay Area, Dr. Stoller became increasingly aware of the incidence of misdiagnosed Lyme disease as he encountered as many as 3-5 cases per day. When he learned that the Peninsula did not have a free-standing hyperbaric chamber, an important treatment mechanism, he opened the Hyperbaric Oxygen Clinic of San Francisco (www.hbotsf.org) with the help of neurologic chiropractor Sergio Azzolino, DC. Dr. Stoller has a new book coming out in the spring of 2016, Incurable Me (www.incurable-me.com), that will share many of his Lyme-treating secrets. He also has a recent article published in the International Journal of Current Advanced Research, entitled “Overview of Lyme Disease: A Critique of an Ignored Pandemic” (Vol 4, Issue 10, Oct. 2015), that discusses the many misperceptions and challenges surrounding this epidemic.